so beautiful. :) I would love to just sit there and watch the big city from afar. Is a shared solitude still solitude?.. Alone or not, I would enjoy to be sitting there very much.. Certainly appears still and quiet. A good place to reflect. Excellent! What a beautiful shot. Striking shot with its contrasts of black and white, straight and curved! Nice in black and white. Snow creates such a serene scene. Being in a wheelchair, I can't go there in winter. Thanks for showing me how it looks. This image would not be nearly so powerful in color as it is in b&w. stunning image and such a difference contrast to arizona. I'm with Birdman. 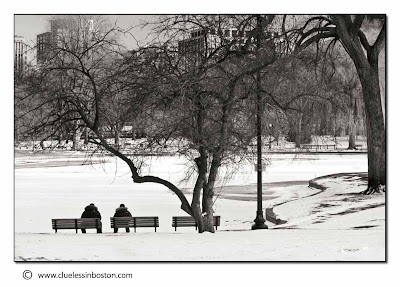 The Public Gardens are spectacular in any season. Delicate and evocative: a magnificent shot!